Harrison & Hetherington Ltd, Carlisle held their Anniversary Show & Sale of Prime Cattle on Monday 20th August. The supreme champion ticket was won by Messrs Barker & Johnstone, Middle Bank Farm with a British Blue cross heifer sired by Tweeddale Ironman. 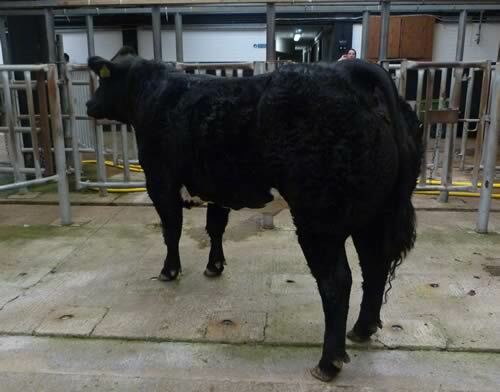 This tremendous almost all black heifer weighed 631kg, and sold at 248.5ppk or £1568. Claiming Reserve Champion was Messrs Anderson, Crosby House Farm, Maryport with a British Blue steer scaling 648kg, and topping the price per kilo at 233.5ppk or £1513. Topping the sale of steers at price per head was a British Blue cross selling for £1601.98 and was consigned by Messrs Story, Newbiggin, Carlisle. The heifers topped at £1659 for a British Blue cross also shown by Messrs Story. The show of Cast Cows was won by a British Blue which also secured the top price of the sale at £1573 (835kg @ 188.5p p/kg. She was shown by Mr Gary Bell, Haas Grove, Lockerbie.